The European Commission is thought to be considering a plan for a single telecoms regulator to cover all 28 member states. The new regulator could take over some of the responsibilities of national watchdogs, like Ofcom in the UK. The Commission told the BBC that the proposal was "not a finished document", so it could not confirm the details. But a leak to the Financial Times appears to show that such plans have been under consideration. The document, produced by the Directorate General for Competition, says "a true pan-EU regulator would be the most effective solution to remove national divergences". It suggests that any new regulator would take over some powers from national bodies. "Advancing further towards a true single market would require gradually moving away from the present status quo of 28 national regulators," it says. In a statement, the Commission said the newspaper article "apparently refers to an earlier draft". It said the plans would only become clear when adopted as a final proposal on 10 September. The EU Commission is already working on proposals to create a single telecoms market in Europe. Neelie Kroes, the EU telecoms commissioner, is in charge of drafting them. Under the plans, European telecoms companies would get access to all 28 member states. They would be required to offer EU-wide mobile packages and would no longer be allowed to levy roaming charges. The industry has been heavily opposed to this idea, which would lose them billions of pounds in revenues. 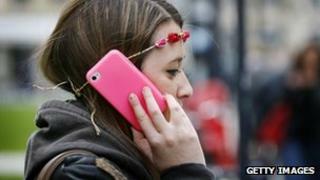 The UK regulator Ofcom said it could not comment on the proposals, as it had not seen them. However, a spokesman told the BBC: "Neelie Kroes has already made it clear that there is no need for a single telecoms regulator." But the Commission is playing down any apparent differences between the Directorate General for Competition and Ms Kroes. It said that Ms Kroes had been drafting the proposals "in close co-operation" with other departments. Analysts say they are not surprised by the idea of a single telecoms regulator for the EU. "It is a logical step. It does make sense," said Dario Talmesio, principal analyst from Informa Telecoms and Media. But the idea leaves many questions. In particular, it is unclear how any such regulator might allocate the use of the spectrum in any individual country. Up to now, spectrums have been seen as national assets, which governments like to control. "To British citizens, it would be like a single regulator deciding how to use North Sea oil reserves," said Mr Talmesio. European mobile operators already feel aggrieved by the weight of regulation coming out of Brussels. Equivalent markets in North America, Latin America and Asia are much less tightly regulated, leaving operators like Verizon, AT&T and China Mobile with much greater profitability. "The tone of regulation has driven European operators to a point where they feel they can't defend themselves," said Shaun Collins, of the telecoms consultancy CCS Insight. Some fear they are now vulnerable to companies with deeper pockets. One example is the recent take-over bid launched by Mexico's America Movil for the Dutch operator KPN. But since February, some in the industry feel that the mood in Brussels has been more conciliatory, with more consideration for telecoms operators. Until now, the EU has appeared to be more on the side of consumers, with its campaign to cut bills.